This year they celebrated their 61st anniversary. Yes, 61 years. Through thick and thin, three children and ten grandchildren, their marriage is still going strong. 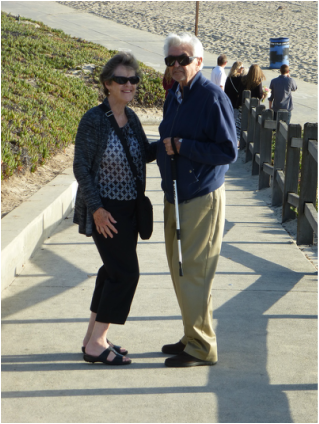 My grandparents, Arthur and Donna Jollymour, are such a wonderful example of what a marriage should look like. They are role models for my own marriage and so, I wanted to share their beautiful story, and their marriage advice for all of you! Can you tell me the beautiful story of how you met? Donna: We met at Cal Berkeley. His fraternity was having an "exchange" - that's what they called get togethers...one fraternity with one sorority - in April 1952 at a park in Berkeley. There were about 60 or so guys and gals enjoying the picnic, getting acquainted, etc. What I didn't know was that he was the fraternity president. I was looking out of our living room window and there parked in front was an empty yellow convertible with the top down. Standing at the far end of the front door, the guys came in and a tall handsome guy walked all the way to the far end of the room and said to me, "Do you need a ride?" "Yes," was my reply. He said his car was the yellow convertible. At school we had a registers file where were could look up names, and the next week being interested, I looked him up and found out he was older than he had told me, actually a senior...I was a sophomore. Several of my sorority sisters were pinned, or engaged, to guys in his fraternity and our spring formal was coming up. So, I asked one of my sorority sisters to ask her boyfriend to invite him to be my date. (I happened to be in the Cal hospital, so I couldn't call him myself). The night of the formal at the Claremont Country Club, May 23rd, we hardly danced. We sat outside on the deck, talking and talking, as if we were old friends who knew each other, but hadn't seen each other for a long time and needed to "catch up". That night we both discovered we were interested in Hawaii. He called me the next week and invited me to dinner, and honestly, two weeks later, after seeing each other practically every day, he proposed, quickly adding, "Not now, someday" and I knew I too felt the same way . We became pinned in the summer, but kept it secret until September when I could announce it at a sorority dinner. In October he gave me my engagement ring. We were on our way to a fraternity party, driving along and he said, "Do you want your engagement ring now?" My reply was, "Yes, please pull over and stop". Arthur: Actually, the exchange was at Joaquin Miller Park in the Oakland hills. When "my fraternity brother", Rich, asked me if I wanted to go to the SK formal with "a Donna something or other", I was in the shower and he hollered it over the the stall wall and four voices answered "sure". On that dinner I invited her to, the night before someone had broken into our fraternity house and stolen my wallet with all my money so she paid for dinner. What has been your biggest marital struggle? Arthur: After 61 years, I can't remember any. Donna: I feel the same way, if there were any. We learned a long time ago not to hang on for very long to disagreements. Easier for him, but I'm still learning. Just get over it - life's too short. I think women are more emotional than men and we tend to hold a grudge until we learn that it doesn't do any good. In the long run, what difference does it make? Sparks come and go, and come again. If they were always around, one wouldn't appreciate them. Life is mountains and valleys and a lot in the middle. What advice do you have for couples who will soon say their "I Do's"? Through the years there have been lots of changes in both of us. Don't expect to make changes in your partner. Embrace each other, adventure, and remember that sometimes it will be 50/50, others 25/75 or maybe 60/40. And remember to respect your differences in opinion. I believe a sharing of "faith" in whatever religion one embraces and a strong family bond are the keys to a long marriage. There have been so many life changes in the past 60 years. We both took our marriage vows very seriously. Marriage isn't a disposable item, if one thinks that way, don't get married. I love you Baba and Papa!